The number of launched projects on Kickstarter (over 89,400) is much larger than the number of successfully funded projects (closer to 37,300). What does that mean? Kickstarter uses an all-or-nothing approach to fundraising. This means, if you don’t hit your fundraising goal within a certain timeframe (about 30 to 60 days), you get nothing. As a result, you need to be very strategic in your planning, goal-setting, and backer solicitation. When you launch a Kickstarter project, your fundraising happens via your Kickstarter campaign page. Potential backers see a description of your concept, your fundraising goal, and an assortment of backer rewards which you determine. A potential backer chooses his or level of support for your project; that person’s pledge goes toward your goal. Kickstarter makes its money by taking a percentage (or fee) from your funds raised. If your Kickstarter campaign is successfully funded, Kickstarter will take 5 percent of your final total for its fee. However, if you come to the end of your Kickstarter campaign and have not reached your project goal, you do not receive any of the pledges listed to date. 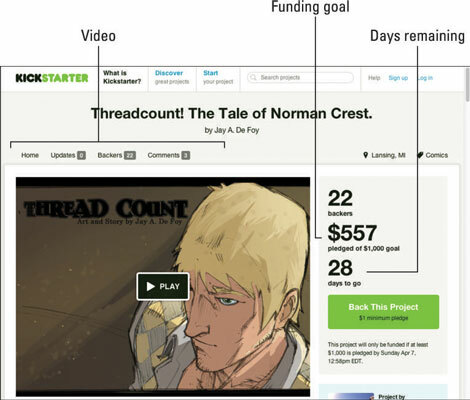 You have to raise your minimum goal amount to receive any of your backer pledges. You also do not pay anything to Kickstarter, since your campaign was not successful. It’s important to remember that Kickstarter is designed to get your project up and running, and you need to have a plan after your Kickstarter campaign is over. A firm deadline forces you to focus on your campaign and on soliciting backers: If you weren’t working against the clock, you might be tempted to wait around to see what backers come in, instead of actively soliciting support. This format encourages you to move your project along quickly. The all-or-nothing approach is less of a risk to your backers: Since nothing gets funded if the project does not reach its goal, backers don’t have to worry about supporting a potentially losing project. They know their accounts will not be charged unless a lot of other people also believe in the idea. Backers can share their passion for a project with a click of the mouse: Because your fundraising happens online, backers can encourage others to get behind an idea through a Facebook or Twitter post that includes a link to your campaign page. 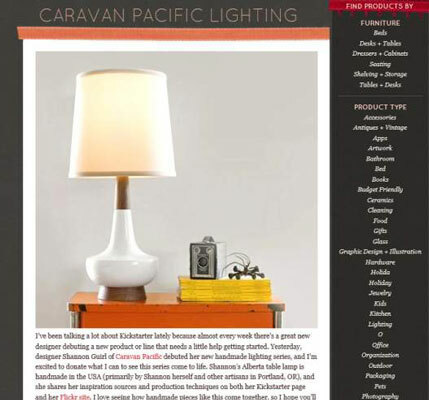 Likewise, bloggers and journalists can boost awareness of your campaign and send potential backers your way with a link on their own blogs or websites. Using Kickstarter to get your project off the ground truly creates a sense of community: Your backers feel like they are really making it happen and are often thrilled to get in on the ground floor of something. You retain creative control over your project: In the past, if you wanted to create a film, art show, project, or play, you needed financial backers. The advantage was that potentially one major investor might give you the funds needed to make your concept come to life — but also exert influence and pressure to change your project to meet his or her specifications. One of Kickstarter’s greatest advantages is that you can still solicit the backing needed to get your project off the ground, but you maintain complete creative control, delivering a product that matches your vision. Kim Krizan, writer of hit movies, Before Sunrise and Before Sunset, knew Kickstarter was the right vehicle for her when she wrote a tongue-in-cheek book about a femme fatale and wanted to produce it on her own terms. Being a successful, established writer, she said on her Kickstarter page that she could “just get it into the hands of a publisher . . . I could also put it online and be done with it. But I thought it would be so much cooler to take it directly to you.” She decided to use her audience to make the project happen without the pressure of a publisher. 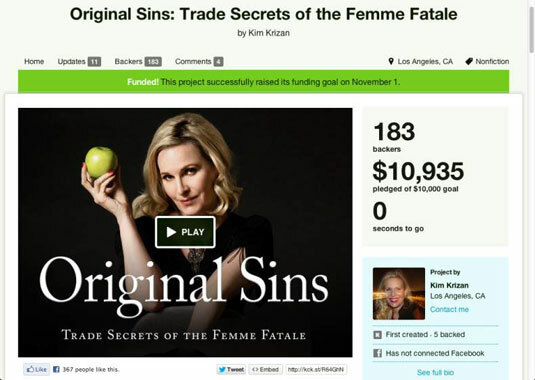 Krizan secured 183 backers and beat her $10,000 goal by almost $1,000. Unlike other web-based tools soliciting funds, Kickstarter is not a fundraising tool for charity. Kickstarter is for projects only, not causes or fundraising drives. Your campaign must be for a specific creative project or concept. If your campaign is determined to be a charity fundraiser, the Kickstarter team will deny your application. Along those same lines, Kickstarter does not allow “Fund My Life” projects. You cannot have an open-ended campaign to raise money for a trip to Bora Bora or help you fund a sabbatical. Kickstarter campaigns are for specific projects and costs. If it appears your Kickstarter campaign is to fund a vacation or allow you to quit your job, it will be denied. Kickstarter also doesn’t allow certain types of content, such as knives, real estate, bath and beauty products, and nutritional supplements. This means projects such as ReadyCase, an iPhone case that includes a multitool with regular and serrated blades, wouldn’t have been a good fit for Kickstarter, even though it’s a legitimate project. 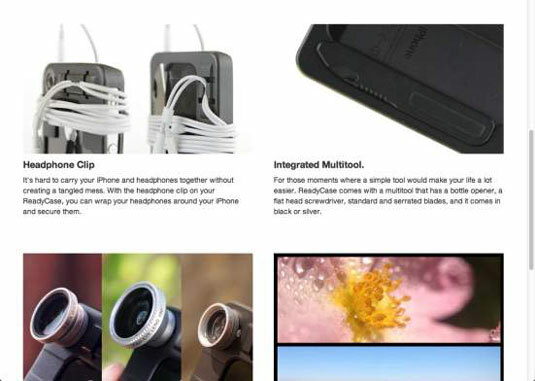 The creators of this case chose a different crowdfunding site called Indiegogo. Indiegogo differs most clearly from Kickstarter on one key issue: It’s not an all-or-nothing approach. Indiegogo has several models that allow you to keep your backer pledges even if you don’t reach your goal, for a higher fee. For the full list of content Kickstarter does and doesn’t allow, check out the Prohibited Uses section of the Kickstarter guidelines.